Every year, Toool NL has a competition that is only open to Toool NL members. A box of around 25 locks travels to all meetings where members can try to pick the locks. What makes this quite different from regular competitions, is that you can get to learn the lock. You are allowed to improve your best picking time throughout the year, figuring out what tool works best and in what order you need to set the pins. 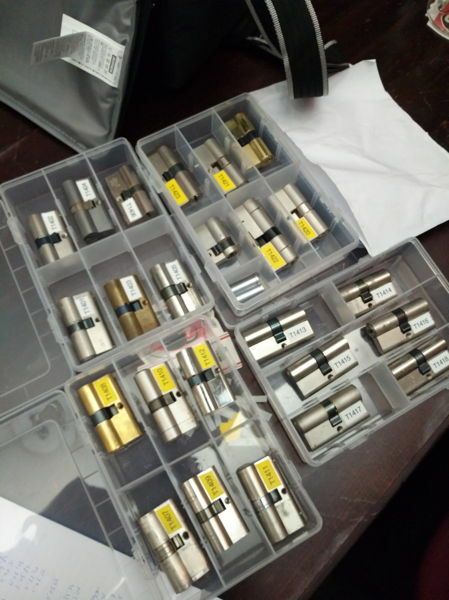 We assembled 26 locks this year, ranging from used locks with no apparant brand name to factory new locks. The Best lock was donated by Christina, some other locks were donated by Eurokey and Locksystems in Eindhoven, thanks! Last years competition was pretty stiff, so we settled for what we believe are slightly easier locks, but time will tell if they really are. The competition page is at https://toool.nl/competitie2017/. This entry was posted on Wednesday, January 11th, 2017 at 10:41 and is filed under Uncategorized. You can follow any responses to this entry through the RSS 2.0 feed. You can leave a response, or trackback from your own site. Entries (RSS) and Comments (RSS). 47 queries. 0.354 seconds.